So here’s the new skin painting in progress today. This asymmetrical stretching is a tricky business, especially in two parts stitched together, but so far so good. First I mummified the rest of the painting to protect the frame and under-layer while I gessoed this one. Then I did a temporary stitch for the sake of tension to bind the two halves together. It has it’s first layer of gesso on, and will get trimmed, un-stitched, re-stitched, stretched from the sides with more cord and gessoed a bit more before I will be able to take off the wrappings and paint. It’s strange working with a red thread and a curved needle. The curved needle is used on things like darning socks (which I have done), but also on medical stitches to hold together a wound (which I have done as well). This process made me think more of the latter. 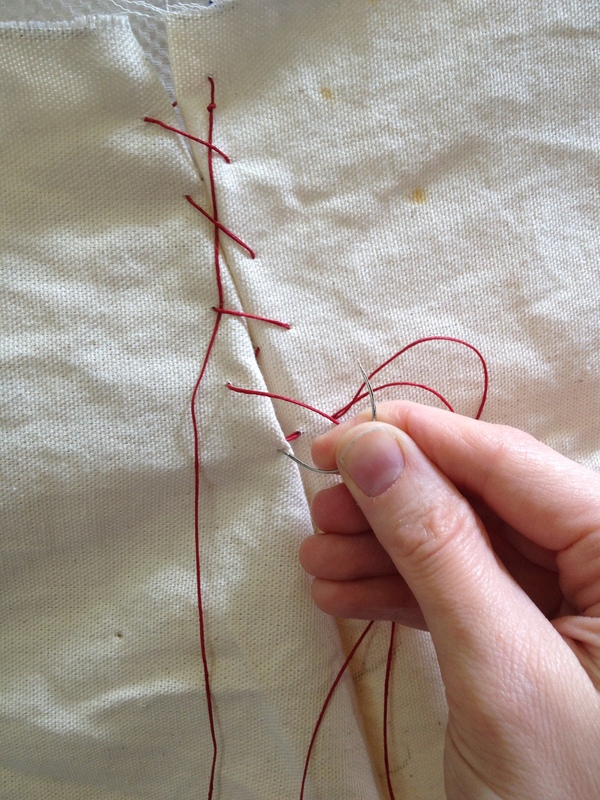 It also reminded me of the practice of sewing up shrouds in hospitals and in army medical units around 1900. This series and an installation piece I have planned interest me in that they have a kind of horror to them but are also quite beautiful. The very idea of stretched skin, exposed bloodiness beneath seems horrific… and yet the form and color can be beautiful. The strain against the frame is intense too. I think of them as having an unseen element- that of us which is not body which comes across in the shape and movement of the piece. I feel like it is an interesting tension- a love-hate with the body. The body’s reality and how somehow what we are is also apart from the body- how those parts of us escape it in a way and are yet bound to it. The visual is beautiful, and yet it can evoke intense struggle and suffering. I find the tension between all these elements beautiful in itself, and very human. That’s what I’m exploring with these stretched skin pieces, and it is interesting to me that it even reaches me in these early stages of the process. « Quick NYC visit and coming home to MFA program.